Daniel Cormier won a closely contested battle against contender Alexander Gustafsson at UFC 192 in Houston on October 3rd to retain his UFC light heavyweight championship belt by a split decision. Two judges gave the fight to Cormier (17-1) with 49-46 and 48-47 scores, and the third had it 48-47 for Gustafsson (16-4). The loss was Gustafsson’s second loss in a row. It was Cormier’s first title defense. Up next for the Cormier, there is already talk of a rematch against former champ Jon Jones, if an when he is reinstated. Cormier lost his first shot at the light heavyweight title to Jones at UFC 182. Then, Jones was stripped of the belt following felony charges for leaving the scene of a traffic accident and Cormier won the vacant championship against Anthony Johnson at UFC 187. Cormier has said that he’d like a rematch, but not in Jones’ home state of New York. Fabricio Werdum pulled off an upset victory at UFC 188 submitting reigning champion Cain Velasquez with a 3rd round. Werdum, the Former PRIDE FC and Strikeforce star is now the undisputed UFC heavyweight champion. While Velasquez gave all of the credit to Werdum, claiming at the post fight press conference "Nothing was wrong. Fabricio was the better guy tonight. That's it," many have cited altitude as a contributing factor in Cain’s performance that has been described in the media as “flat” and “listless”. Werdum was in Toluca, at a higher elevation than Mexico City, for over a month before the fight. While Velasquez arrived only there two weeks early. Cain admitted the altitude got to him. The fight was Cain’s first bout in almost two years due to shoulder and knee injuries. Daniel Cormier defeated Anthony Johnson in the third round of their championship bout at UFC 187 in Las Vegas on Saturday for the vacated light heavyweight title. The bout was Cormier’s second shot at the title in the past five months, and this time Cormier walked out of the octagon as the UFC light heavyweight champion. Cormier wasted little time before calling out former light heavyweight champ Jon Jones, telling The MMA Hour, “He (Jones) doesn't want to see me win. He doesn't want to see me carry what he probably feels is still his title, which it isn't -- it's mine." Jones and Cormier have had a long and heated rivalry that came to a head at UFC 182 on January 3rd, when Jones beat Cormier by unanimous decision. After the fight, Cormier dedicated his title to his wife and family that supported him on the difficult path to the pinnacle of the sport. UFC’s decision to strip Jon Jones of the UFC light heavyweight title following his arrest for an alleged hit-and-run has opened the door for Daniel Cormier to once again vie for the UFC light heavyweight crown. Cormier will face Anthony “Rumble” Johnson at UFC 187 on May 23rd at the MGM Grand in Las Vegas for the belt. UFC 187 was expected to be headlined by a UFC championship bout between then champion Jones and Johnson, however on April 28th, due to Jones' hit-and-run incident, the UFC decided to strip Jones of the title and suspend him indefinitely. Jones was replaced by Cormier, who was scheduled to face Ryan Bader at the main event of UFC Fight Night 68. Luke Rockhold (14-2) impressively beat former light heavyweight champ Lyoto Machida Saturday, submitting Machida in the second round of their UFC on FOX 15 bout via rear naked choke. It was only the third time that Machida was stopped in his 12-year career. Rockhold will likely meet the winner of bout between Chris Weidman, the UFC middleweight champion, and Vitor Belfort at UFC 187 on May 23rd. The UFC has not officially announced a date for the highly anticipated heavyweight championship bout between Cain Velasquez and Fabricio Werdum, but Werdum recently posted on social media and told The MMA Hour that he expects the fight to take place at UFC 188 on June 13th in Mexico City. Werdum is the interim champion after defeating Mark Hunt by TKO in the second round of their bout on November 15th in Mexico City. The UFC has two events scheduled in Mexico this year, after a successful UFC 180 last year where they sold out 24,000 tickets in less than eight hours. Reigning champion Cain Velasquez has not fought since his TKO victory against Junior dos Santos in October of 2013. In what was billed as the possibly the biggest fight ever to come to UFC, Daniel Cormier lost to Jon Jones by unanimous decision in Las Vegas on Saturday. Jones is considered by many to be the top pound-for-pound fighter in the sport, but Cormier is one of the most respected fighters in MMA and considered to be Jones biggest test so far. Cormier is a two-time Olympic wrestler, who had never lost a fight or even a single round until the opening round of the Jones fight. The victory was Jones eighth successful defense of his title since winning the belt in 2011. Cormier turns 36 in March. Next, Jones will likely fight the winner of the January 24th bout between Anthony Johnson and Alexander Gustafsson. The rivalry between Cormier and Jones has been well documented, including a melee between the two last summer that resulted in disciplinary action for both fighters. Their light heavyweight title fight was originally scheduled for September, but was postponed after Jones was injured. Velasquez was originally scheduled to fight Werdum for the title in Mexico City at UFC 180 this month, but the fight was called off when Velasquez injured his knee while training for the bout. The UFC brought in Mark Hunt to replace Velasquez, and created an interim heavyweight title, which Werdum won by TKO’ing Hunt in the second round. UFC President Dana White confirmed this week that plans are set for the unification bout in June in Mexico City. If the fight occurs in June as scheduled, it will have been 20 months since Velasquez’s last fight, a TKO against Junior dos Santos at UFC 166 in October 2013. Werdum is on a five fight win streak, and Velasquez currently has a four fight win streak. Phil Davis cruised to an easy victory over Glover Teixeira at UFC 179 in Rio de Janeiro this weekend erasing memories of his loss to Anthony Johnson and removing any doubt that he remains a force to be reckoned with in the UFC. The victory raises his stock and puts #6 ranked Davis right back into mix in the light heavyweight division. After the fight, Davis called out middleweight Anderson Silva, who was in attendance, suggesting that he'd like to face Silva, perhaps after Silva's scheduled bout with Nick Diaz at UFC 183 on January 31st. UFC heavyweight Cain Velasquez injured his knee in practice this week and will not face Fabricio Werdum at UFC 180 on November 15th in Mexico City. The injury will likely sideline Velasquez for a couple of months and delay his highly anticipated return to the octagon. The cancellation comes just three weeks before the sold out event. UFC Veteran Mark Hunt will take Velasquez’s place against Werdum. While preparing for his January 3rd fight with Jon Jones, Daniel Cormier will have some additional work sitting alongside Kenny Florian on the weekly show which airs on Wednesdays on Fox Sports 1. Cormier has been a fixture on FOX for the past couple of years, filling in on UFC Tonight and conducting interviews, and pre and post fight interviews. During that time, Cormier has emerged as one of the top analysts and commentators in the sport. UFC 180 featuring the highly anticipated bout between UFC Heavyweight Champion Cain Velasquez and Fabricio Werdum will be broadcast at select movie theaters via a partnership between UFC and Fathom Events. This is not UFC's first event to be aired at movie theaters, most recently UFC 167 featuring Georges St-Pierre vs. Johnny Hendricks appeared in theaters. The event will be broadcast live on November 15th. Tickets went on sale October 16th. Despite a 13 month layoff since his last bout, Cain Velasquez is heavily favored to bring home a victory at UFC 180. The heavyweight champion Velasquez is a significant 4.5-1 odds-on favorite to dispose of Fabricio Werdum on November 15th in Mexico City. The Arena Ciudad de Mexico will host the event, the first major UFC event to be held in Mexico. Daniel Cormier and Jon Jones appeared before the Nevada Athletic Commission today to receive punishment for their melee at the MGM Grand Hotel is Las Vegas in August. The two fighters went in front of the commission separately to answer questions before receiving their penalties. During the proceedings Jones admitted that he lost his Nike endorsement deal as a result of his actions during the altercation. Jones didn’t say how much money he was making from Nike, but he did indicate that he was making six figures from the deal. After deliberation, Jones was fined $50,000 for his part (10% of his $500,000 purse) and sentenced to complete 40 hours of community service in Nevada. Cormier received a fine of $9,000 and 20 hours of community service in his hometown of San Jose, CA. 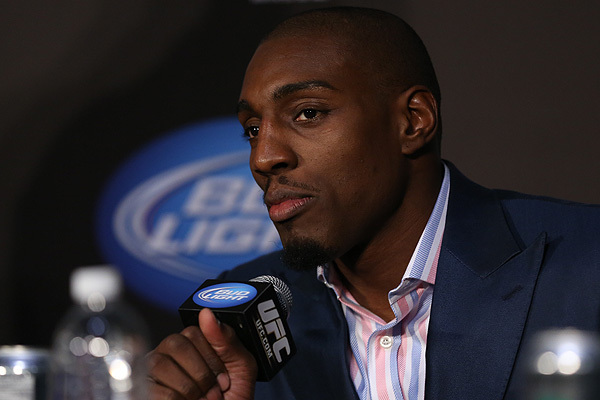 Phil Davis will face off against Glover Teixeria in the co-main event at UFC 179 October 25 in Rio De Janeiro. Both fighters are coming off of losses, the first losses for each of them in the UFC. The bout gives one of the fighters the opportunity to reestablish himself in the light heavyweight division which rife with talented fighters including the likes of Jon Jones, Daniel Cormier, Alexander Gustafson and Ovence Saint Preux. UFC light heavyweight champion Jon Jones injured his leg, forcing postponement of his title fight with Daniel Cormier that was scheduled for UFC 178 on September 27 in Las Vegas. Now, Jones and Cormier will headline UFC 182 on January 3, 2015 at UFC’s traditional year-end show in Las Vegas. Flyweight’s Demetrious Johnson and Chris Cariaso will fight for the title in the new main event at UFC 178. Undefeated Daniel Cormier will fight Jon Jones at UFC 178 for the UFC light heavyweight championship, after an injury forced Alexander Gustafsson to pull out of the bout. Jones (20-1) was originally planning to fight Cormier (15-0) after his bout with Gustafsson. After defeating Dan Henderson in May at UFC 173, Cormier admitted that he fought through a torn LCL and partial ACL tear in his right knee. Cormier was expected to undergo surgery on the knee this month, but will wait now to pursue the UFC light heavyweight title. The pay-per-view event is scheduled to take place at the MGM Grand Garden Arena in Las Vegas on September 27, 2014. Coaches Cain Velasquez and Fabricio Werdum lead a total of 16 fighters, comprised of the bantamweight and featherweight divisions. Velasquez's team is made up entirely of fighters from Mexico. Werdum, from Brazil, coaches fighters from Central America and South America. The 12-episode season will debut in August on UFC Fight Pass in the U.S.
UFC light heavyweight champion Jon Jones appeared on "America's Pregame" on Fox Sports 1 earlier this week and was asked who he felt was more deserving of a title shot between Alexander Gustafsson and Daniel Cormier. Jones responded, "I would say Daniel Cormier has better accolades and has the better record. He's undefeated and he's beaten former world champions before. He is a world champion in the Strikeforce organization. So I would say Cormier". Jones went on to say that his opinion wasn't the one that mattered most, "I think the fans want to see me fight Alexander more and I think that's what's most important." Ben Askren extended his professional MMA record to 13-0 with a first round submission win against Bakhtiyar Abbasov at ONE FC: Honor & Glory Friday in Singapore. Askren forced Abbasov to tap out in the first round of the co-main event at the Singapore Indoor Stadium with an arm triangle choke. The win was Askren’s first since signing with Asia’s biggest MMA promotion. Next up, Askren will likely get a title shot at reigning welterweight champion Nobutatsu Suzuki. Daniel Cormier submitted Dan Henderson early in the 3rd round of their co-main event match that pitted the former Olympians on Saturday at the MGM in Las Vegas. The victory elevated Cormier's record to 15-0. The win was Cormier's fourth against former champions in three weight divisions - Antonio "Bigfoot" Silva, EliteXC heavyweight; Josh Barnett, UFC heavyweight; Frank Mir, UFC heavyweight; and Dan Henderson, PRIDE and Strikeforce light heavyweight, and PRIDE middleweight. The win puts Cormier in line to fight light heavyweight champion Jon Jones, either before or after Jones fights Alexander Gustafsson. Daniel Cormier’s highly anticipated bout this Saturday against fellow former Olympian Dan Henderson at UFC 173 at the MGM Grand in Las Vegas will be a closely watched bout. The winner of this co-main event puts himself in line for a potential fight against light heavyweight champ Jon Jones. The 43-year old Henderson is 30-11 and coming off an upset technical knockout victory against Mauricio Rua in March. Henderson is an MMA legend as the former PRIDE middleweight and welterweight champion and Strikeforce light heavyweight champion. The former Strikeforce champion Cormier, 35, is 14-0 and has never lost a round in his professional MMA career. Despite Cormier being a 5-1 favorite in Vegas to win the fight, this intriguing match-up will not disappoint. Following his loss to Anthony Davis at UFC 172, Phil Davis dropped to #7 in UFC's latest light heavyweight rankings. Meanwhile, Luke Rockhold remained the #5 ranked UFC middleweight and is rumored to be closing in on a title shot after his win. Luke Rockhold look impressive as he finished Tim Boetsch in the first round of their main card fight at UFC 172 in Baltimore on Saturday via submission. After Boetsch attempted a takedown, Rockhold locked on a triangle with the legs and then transitioned to a Kimura, forcing Boetsch to tap out at 2:08. After the fight, Rockhold said he wants to earn a UFC middleweight title shot, claiming that the best way to go about it is by taking on Vitor Belfort in a rematch, although he added that he would also accept a fight with Michael Bisping. Anthony Johnson (17-4) made a successful UFC light heavyweight debut Saturday at UFC 172, as he beat the highly ranked Phil Davis in the co-main event at Baltimore Arena. All three judges scored the contest 30-27 for Johnson. The loss was Davis’ first loss since January 2012. Pico, who last year was a FILA Junior Nationals double champion was also awarded the Outstanding Wrestler Award for the event. The Fila Junior National Championships feature many of the top young college stars and talented high school athletes from across the nation. The 17-year old sophomore Pico was dominant throughout the tournament. He was unscored upon throughout the competition, tallying 61 points against his six opponents, all of which are in college. The win puts Pico one best-of-three series away from getting another chance to compete for a World title. Meanwhile, Anthony Johnson (16-4 MMA, 7-4 UFC) the fighter that will face Davis in the co-headliner at UFC 172 on Saturday, feels he’s not getting his due, “I think he (Davis) doesn't take me too seriously. I think he doubts me just a smidge and that's all I need." The winner of this Saturday's heavyweight main event at UFC on Fox 11 between Fabricio Werdum and Travis Browne will earn a shot at UFC heavyweight champion Cain Velasquez later this year. UFC president Dana White announced that Velasquez would be defending his title against the winner of the bout in Mexico at the UFC on FOX 11 pre-fight press conference on Thursday. This will be the inaugural UFC event to be held in Mexico. The time and location have yet to be determined. Sources say that the UFC is working on signing a match between light heavyweights Daniel Cormier and Dan Henderson at UFC 175 July 5th at the MGM Grand Garden Arena. Cormier (14-0) is coming off of a decisive first round victory over Patrick Cummins at UFC 170, for his third win in the UFC. Henderson is coming off of a win against Mauricio "Shogun" Rua at UFC Fight Night 39. Jon Fitch will get a shot at the WSOF 170 lb. title this July against Rousimar Palhares, at a site and date to be determined. Fitch is coming off of a victory against Marcelo Alfaya at WSOF 6. Palhares beat Steve Carl at WSOF 9 to win the title. It will be Palhares first defense of his title. UFC Heavyweight Champion Cain Velasquez is hoping to fight sometime around November, likely against the winner of the upcoming Fabricio Werdum v. Travis Browne bout. Velasquez had shoulder surgery in December after his win over Junior dos Santos in October in UFC 166. Velasquez has been rehabilitating and could be close to getting his doctor's okay to start training again. Velasquez's father is from Mexico. Daniel Cormier only needed just over a minute to knock out Patrick Cummings at UFC 170 at the Mandalay Bay Events Center on Saturday. Cummings was a late fill in for Rashad Evans who sustained an injury. The win elevated Cormier to 14-0, and 3-0 since moving to the UFC. Josh Thomson fought gallantly but came up short losing a split decision to Benson Henderson in five rounds at the United Center on Saturday. The loss dropped Thomson to 20-6 and likely cost him a shot at the title. Thomson injured his right thumb in the first round prompting officials to ask him if they should stop the fight. Thomson continued, but as the fight wore on the injury became more evident. Thomson was supposed to fight Anthony Pettis in December for the lightweight title, but Pettis hurt his knee and withdrew from the bout. Thomson was supposed to have a shot at the title in December until current champion Anthony Pettis injured his knee and had surgery. Ben Henderson has no sympathy for Thomson's "worst camp ever"
Henderson recently told Fox Sports "It just makes me think, ‘that’s life. That’s how it works out sometimes. I’ve had some of the worst camps in my life where things didn't go well lead into some great performances. I’ve had some training camps go very well and the fight go not so well. I don’t really think it’s that much of an indicator of how someone will perform once the lights are on and the cage door is locked." Former Bellator Champion Ben Askren (12-0) has accepted an offer to fight for Singaporean promoter ONE FC for six fights over two years. Askren is slated to make $50,000 guaranteed in his first fight and would get another $50,000 if he wins. After that, Askren's purses increase for each subsequent bout as long as he keeps winning. Askren signed with ONE FC after he was relased by Bellator and UFC did not tender an offer to the undefeated welterweight. Askren also recieved an offer from World Series of Fighting, but opted to go with ONE FC's offer which could be worth close to $1 million dollars. Askren expects to make his debut in March or April. Phil Davis (12-1 MMA, 8-1 UFC) recently spoke with MMAjunkie Radio implying that Jon Jones may be scared to get back into the octagon. Davis is questioning why Jones has withdrawn from three successive UFC events (UFC 169, UFC 170, and UFC 171). “Alexander Gustafsson put tips all over that boy. [Jones] doesn’t know up from down, left from right. So I really don’t see him wanting to get back in there with anybody – definitely not Alexander. I don’t even think he wants to get back in there with Glover Teixeira – bless his little heart." said Davis. Thompon recently spoke with FOX Sports saying,"I've gotta say it's probably been one of my worst camps I've ever had in my history of fighting. Just being honest. It's been a rough camp, been a long camp... I think what happened was four weeks with [Anthony] Pettis then I took a week off because the fight was canceled and then I got the call to fight Benson [Henderson] so I thought, don't break the routine too much, jump back into camp and I think what happens when you have such a long camp it just starts dragging on and on and on. You're just not feeling it anymore. You're losing motivation, whatever the reason being. It's been a long, just distracted kind of camp, it's been really weird...There's no excuses, I'm just telling you like it is. The thing is sometimes it makes me rise to the occasion so that what I'm hoping happens. I can't say it's going to look pretty in this fight, but I've got to go out there and get the 'W' no matter what happens...This is what I tell everybody - I don't have to be better than Benson every single day of my camp, I've just got to be better than him on one night. So I'm not really concerned about everything that's happened during this camp." UFC on FOX 10's weigh-in Scheduled for January 24th at the Chicago Theater, a nearly 100 year old historic theater on Chicago's State Street. Fans are invited to attend the weigh-in ceremony, which is free and open to the public. Doors open to the public at 3 p.m. local time, and the first fighter hits the scale at 4 p.m.
Before the fighter weigh-ins, UFC Fight Club members can take part in a Q&A session at 2 p.m. which will feature a UFC fighter still to be determined. Chicago Theatre, a nearly 100-year-old institution on the city’s historic State Street, has hosted UFC weigh-in events each of the three previous times the promotion has visited Chicago for UFC 90, UFC on FOX 2 and UFC on FOX 6. UFC on FOX 10 will be the UFC’s third straight January event in Chicago on the FOX Network. In 2012, UFC on FOX 2 featured a light heavyweight title eliminator between Rashad Evans and Phil Davis. And UFC on FOX 6 in 2013 featured a flyweight title fight between champion Demetrious Johnson and challenger John Dodson. Luke Rockhold defeated Constantinos Philippou in the main event of UFC Fight Night 35 at Arena at Gwinnett Center in Duluth, GA last night with a pair of kicks to the body 2:31 into the first round of a scheduled five round fight. The bout aired on FOX Sports 1. Rockhold's resounding victory showcased the skills that have elevated him as one of the top 185-pound fighters in the world. After the win Rockhold (11-2 MMA, 1-1 UFC) called for a rematch with Vitor Belfort, as well as a potential bout with British slugger Michael Bisping.